It’s no secret that Planet Tokyo is obsessed with robots. While we’ve written extensively about how Japan leads the world in the field of robotics, we haven’t offered much in the way of visual evidence. That’s about to change as we introduce a new semi-regular feature: Planet Tokyo Robot Theater. Through the wonders of YouTube.com we’ve uncovered a seemingly endless stream of fascinating Japanese robot videos. Our debut episode of Robot Theater features a couple of clips from last month’s Robo-One 9 competition in Tokyo. Both clips have been provided courtesy of Robots-Dreams.com. We’ve also mixed in a couple of clips of our favorite robotic sub-species: Swimming Robots. Click the video box below for an amazing display of robotic technology. Planet Tokyo’s love for robots knows no bounds, and it’s with great sadness that we say goodbye to Sony’s Aibo, that lovable little robotic dog known for its unique personality, stubborn streak (building a little defiance into a robot is pure genius), and scampering gait. As the tiny robot lopes off into the sunset, a giant robot, designed to help in avalanches, is making the scene. Like so many things Sony has made over the years, the Aibo is a niche product. And since Sony is pulling the plug on robot production as part of a major restructuring, so goes the Aibo. Aibo fans are deeply saddened and not just a little worried about getting replacement parts for their favorite robots. Sony-watchers worry that this is further evidence of a company losing its innovative edge. Planet Tokyo wonders how much the cost of producing the Aibo really adds to Sony’s expenses versus the good will the robot generates (apparently it is even used in therapy). Enryu’s 15-foot arms are powerful enough to lift a small passenger car, and its hands are almost as dexterous as a human being’s. 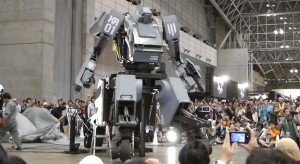 And the 5-ton, 11.5-foot robot may soon be helping communities across Japan reach avalanche sites and clear snow, as the nation struggles to deal with its snowiest winter in decades, said Japanese company Tmsuk Co.
Other uses for Enryu include helping work through debris caused by earthquakes and other disasters. If you are of a certain age you probably grew up believing that by the early 21st century we’d all live in a world of human-like robot servants. We were promised a veritable utopia of robotic cooking and cleaning that has yet to materialize. Instead, the best we have is a small disk that scoots around the house vacuuming up pet hair. Unless you live in Japan, robot capital of the world. While the rest of the world has pursued the robot utopia with a distinctly human skepticism, Japan has lunged headlong into the future building a stunning array of robotic devices that perform an astounding collection of tasks. As we’ve noted previously, Japan seems to have been invaded by an army of robots capable of doing everything from guarding stores to playing baseball. It’s tempting to suggest that Japan’s advances in robotics have been motivated by practical interests. Japan employs a workforce of 400,000 industrial robots — nearly half of all such robots in the entire world. However, the Japanese also create robots that are surprisingly whimsical. While Sony’s robotic dog has been a huge hit in Japan, it doesn’t serve much of a practical purpose — except maybe to demonstrate how completely at ease the Japanese are with robots. When I finished my Ph.D., Japan looked like a very good place to do robotics. This is a polite way of saying that most of the world is not. The question remains, how did Japan get to be such a good place to pursue robotics? Japanese thought stresses harmony and does not tend to see confrontational situations. The idea that robots may be a potential enemy just doesn’t exist in Japan. Japan’s religious beliefs also contribute to the country’s acceptance of Robots in all aspects of life. The Shinto religion places an emphasis on the concept of animism. As a result, the Japanese tend to see spiritual aspects in all things — including robots. America finds the idea of technology with personalities to be … spooky. After all, the notion of objects with minds of their own runs counter to deeply ingrained Judeo-Christian values — creating devices that can move and think without human intervention veers a little too close to playing God. Shinto, Japan’s homegrown religion, is an animist faith. The Japanese embrace of robots is a logical extension of ancient beliefs that all things, living and nonliving, organic and inorganic, can possess a transcendent spirit. Besides religion, there’s also Japan’s notoriously complex system of etiquette. For many Japanese, dealing with robots may actually be easier than dealing with humans. In Japan, nearly every social interaction is fraught with potential risk. Simply asking a stranger for directions could lead to multiple levels of embarrassment for both parties. Robotic servants eliminate this risk — although at the risk of creating a new level or etiquette reserved specifically for interaction with robots. However, the most compelling reason for Japan’s robot dominance seems to be related to the country’s traditionally homogeneous culture. As Japan’s workforce ages the country faces a significant labor shortage. Given the option of importing foreign workers or building robots to do the work, the Japanese seem to prefer robots. Japan has consistently resisted requests from countries such as the Philippines to increase the number of visas available for nurses. Instead of importing foreign nurses, the Japanese have undertaken the development of robotic devices designed specifically to care for the elderly. Several of these machines are already on the market, including a washing machine for humans and a pair of battery powered robotic pants that are designed to help people with mobility problems move without human assistance. All of these reasons combined seem to indicate that Japan may ultimately become the robot utopia of our childhood dreams. Whether or not the rest of the world follows suit will remain to be seen. Here is a question for the ages: why is it that male (or ostensibly male) robots look like fat white spacemen while female (and we use the term loosely) robots look like Barbie dolls? Is it because the coolest Cylons on Battlestar Galactica are the women? . . .flexible silicone for skin rather than hard plastic, and a number of sensors and motors to allow her to turn and react in a human-like manner. Japanese develop ‘female’ android – Japanese scientists have unveiled the most human-looking robot yet – a “female” android named Repliee Q1Expo. Japan is literally being invaded by robots. They’re tasting food and guarding stores and doing just about everything humans used to do, but are apparently now too old to do. Will Japan’s population ultimately be replaced by robots? Take a look at some of the robotic projects currently under way and judge for yourself. NEC’s Health Food Advice Robot wants to help you eat better. She can determine the fat content in your food, tell you when your milk goes bad, and administer dietary advice in a non-judgmental robotic way. If NEC ever merges with Fujitsu I suspect they’ll license the HOAP Robot’s ability to make facial expressions. Imagine your Health Food Advisor raising her eyebrows as you reach for that second helping of ice cream. As Japan’s population gets older there are fewer young people available to take some of the higher risk jobs like security guard. Fortunately Sogho Security Services’Guardrobo D1 will soon be stepping in to guard department stores and factories. The Guardrobo has the ability to detect leaks and comes equipped with a fire extinguisher, and presumably the knowledge to actually use it in a timely manner should something he’s guarding catch on fire. It’s not clear what happens if someone steals the robot. Speecy’s of Tokyo has produced the world’s first fuel cell robot. The eco-friendly robot is powered by Hydrogen canisters and never needs charging. This will almost certainly create a new market for a robot canister changing robot. If the robot from Hiroshima’s research lab ever makes it out of the lab and onto a baseball diamond we’ll probably forget all about Barry Bonds and the steroid issue. The Baseballbotcan hit a 300khm fastball. As a single tool player he’ll probably have to play DH. Bonds isn’t the only pro athlete with competition. A company called Nirvana Technology is working on a golf playing robot. This makes perfect sense when you consider that robots are now performing brain surgery. They may be robots, but they’re also doctors and they’ll need a hobby. I could go on, but honestly there are probably half a dozen new robots on the streets of Tokyo since I started writing this article. I suspect I’ll soon hire a robot to write this blog. Visitors to Japan are frequently surprised by the amazingly lifelike plastic food that is displayed at the entrance of nearly every restaurant throughout the country. It’s a clever marketing innovation that strangely hasn’t caught on around the world. After years of unchallenged plastic food dominance, the Japanese have added a new innovation to their specialty: High speed data storage. Dynamism has recently released several USB storage devices in a variety of sushi flavors. Perhaps you’d like the 128MB Ebi? If you’re not so hungry then maybe you’d prefer a 32MB Teka roll? These Sushi Data Drives are handmade in Tokyo to conform to the strictest plastic food standards. Never again will you have to choose between having sushi or having a USB memory drive–thanks to the USB sushi drive. Frankly, I never realized the two were mutually exclusive, but now that I can easily combine the two, why not? While it’s true that the USB connector makes this sushi look slightly less realistic they’re still hard to resist. I just wish there was there was a way to spice up the data these things carry. What PowerPoint presentation wouldn’t be improved by a little wasabi? A surprisingly large portion of my first trip to Tokyo was spent scouring various toy stores in search of Japanese robots. What could be a cooler souvenir of my trip to Japan? It was the mid-90’s and after days of searching I had a couple of articulated plastic robot figures and deep sense of disappointment. Japanese robots have come a long way since then, mostly thanks to Sony. The QRIO (previously known as “The Sony Dream Robot”) is a “biped entertainment robot”. That would be a robot that walks on two legs (biped), although I’m not sure exactly what the entertainment part is. Hopefully he doesn’t sing. QRIO not only walks on two legs, it can also manage uneven surfaces, dance, recognize people’s faces and voices, and carry on conversation. I was actually hoping that the entertainment part might refer to an ability to manage the ever increasing number of electronic devices in my living room. Who needs a universal remote when you’ve got an entertainment robot? For now the QRIO is just a prototype. Judging from QRIO’s personal appearance schedule the life of a prototype is pretty rough. Hopefully they’ll be mass producing these soon so QRIO doesn’t have to spend so much time on the road by himself.